This post is in partnership with AVA Grace. Thanks for supporting the brands that support Inspired by This! Fall is in full swing and the holidays are upon us – can you believe it!? 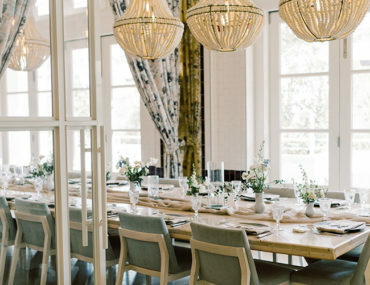 While this busy season can tend to be just that – busy – we want to help you prepare for all the hosting and party attending ahead. With a little help from us… and our favorite wines, we hope you’ll be able to savor and enjoy all the precious moments. Yes, we said wine! 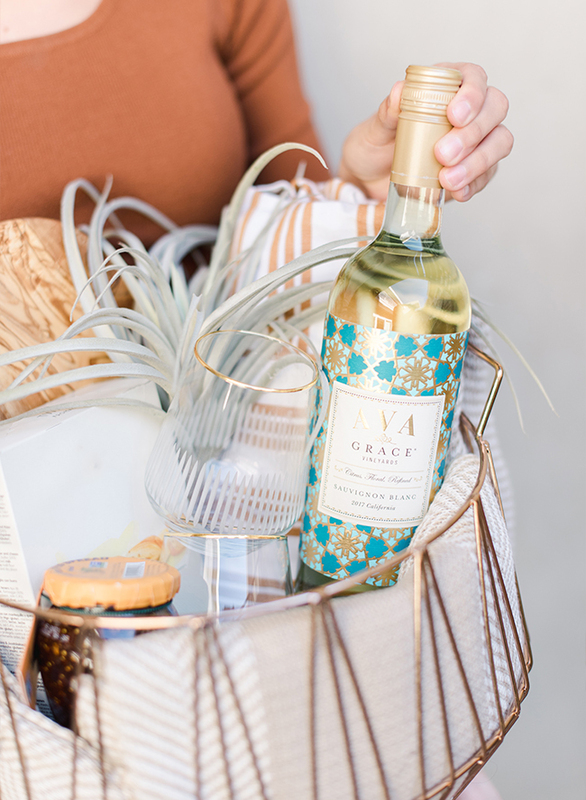 We are sipping our favorite elegant varietals from AVA Grace Vineyards this season, but also gifting them! Because good wine shouldn’t be kept to ourselves, right? Plus, we can never show up to a fall or holiday party empty handed. 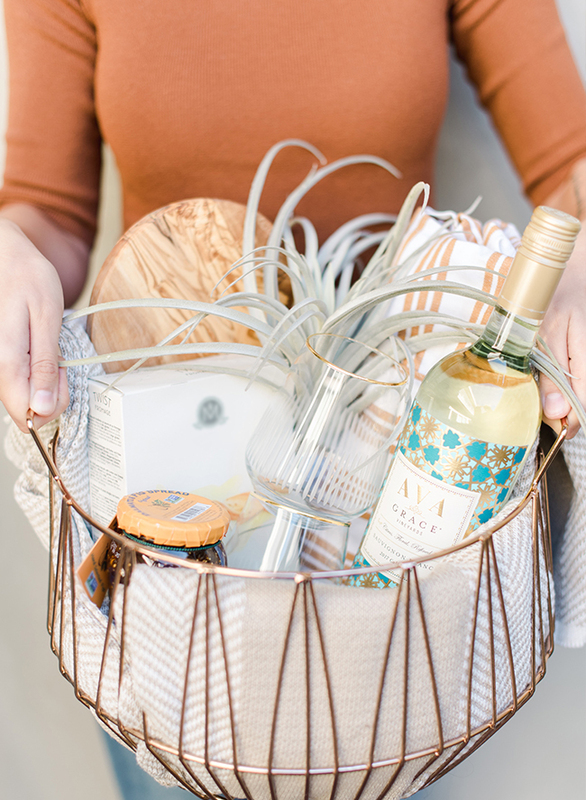 So, we crafted a couple homemade hostess gift baskets for the wine lover in your life. 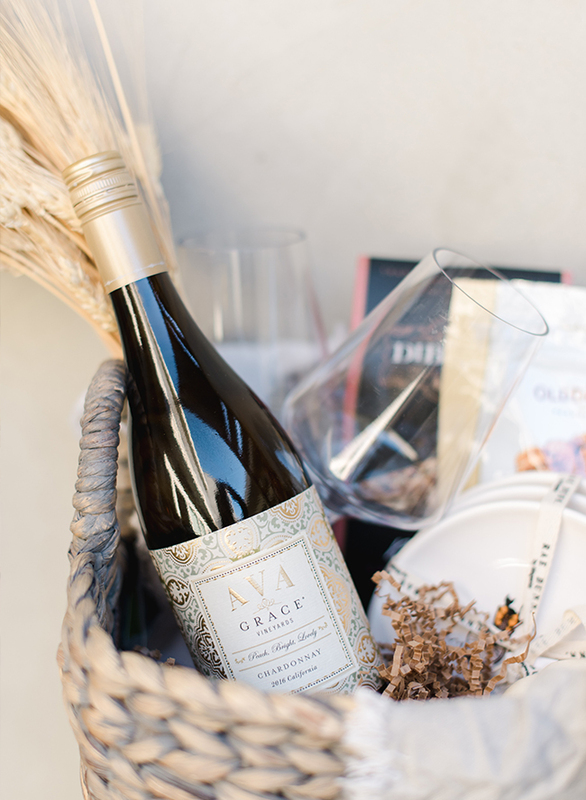 While we chose to include AVA Grace Chardonnay and Sauvignon Blanc, we encourage you to pick the recipient’s favorite varietal! Their Red Blend is another one of our faves! With notes of blackberries and raspberries, hints of spice, and flavors of cranberry, it’s the perfect choice for the holidays. 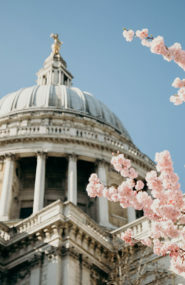 You can also see how we pair it, as well as the Rosé, here! 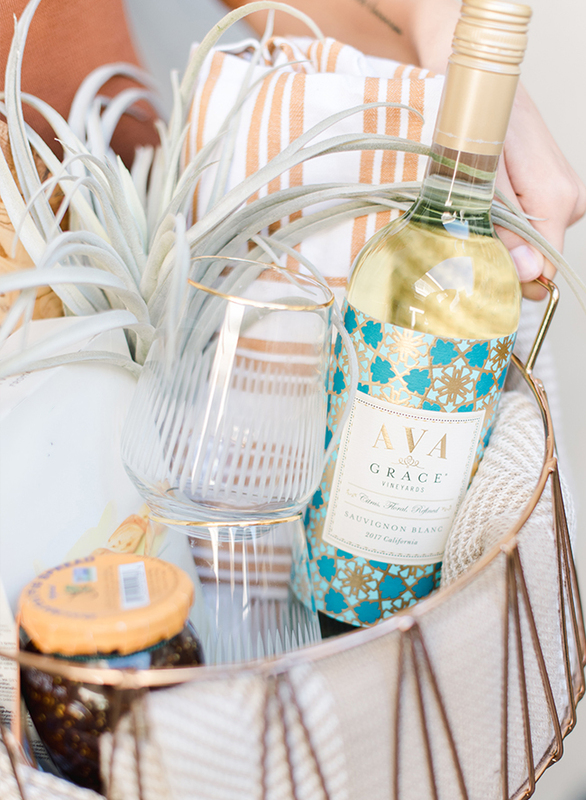 This Sauvignon Blanc boasts notes of tropical fruit flavors, offers fresh aromas of grapefruit, gooseberry and melon, and has a rich body. We paired it with light snacks like cheese crisps and fig jam, that together can be displayed on the wooden board as appetizers. And who doesn’t love pretty glassware? The hostess can never have too many glasses on hand! We also threw in an air plant, which is easy to maintain and brings some color to the gift. And the base of it all? A woven throw blanket, perfect to cozy up with, laid in a gorgeous gold wire basket. This basket is like dessert! 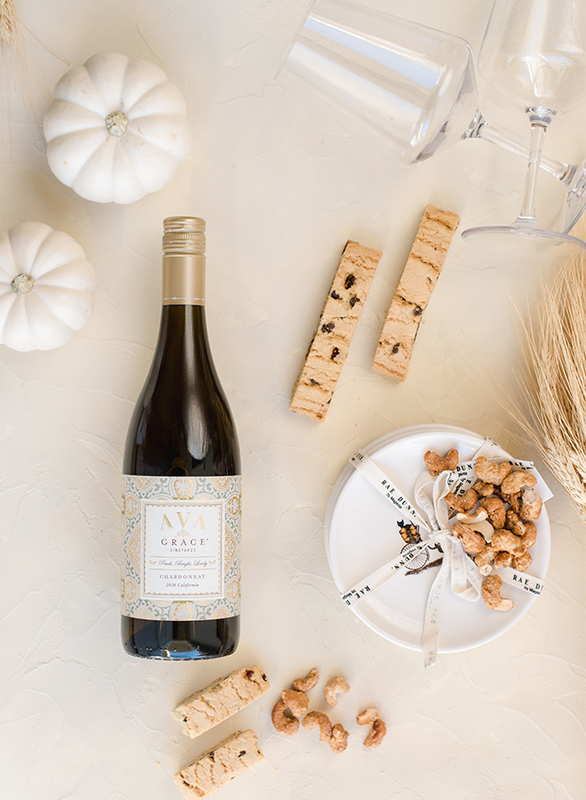 And with a wine that boasts bright fruit flavors of white peach, apple and lemon and the smooth finish of almonds and vanilla, with a delicate touch of oak, it’s easy to see why. We included sweetened cashews and biscotti cookies, which can be served on the cutest little plates that are also tucked in the basket! We picture the hostess pouring the golden Chardonnay into the elegant stemware as she sits down at a table set with mini pumpkins and a bouquet of wheat as the centerpiece. Quintessential fall. 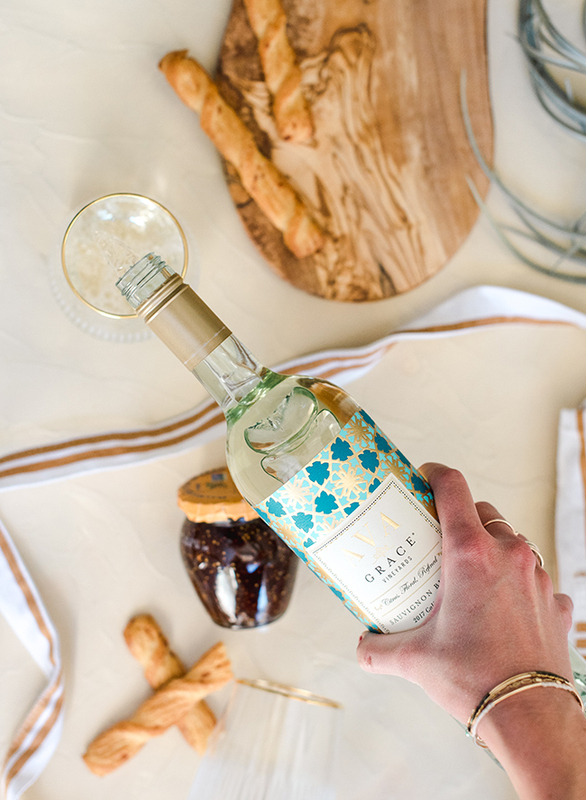 Even the bottle is pretty enough to serve as decor! 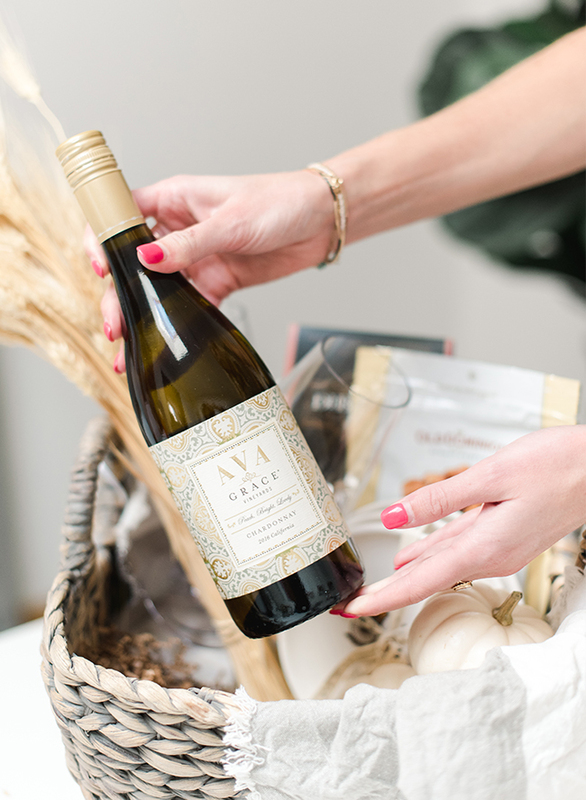 We have many a Chardonnay lover in mind who would be head over heels for this gift! 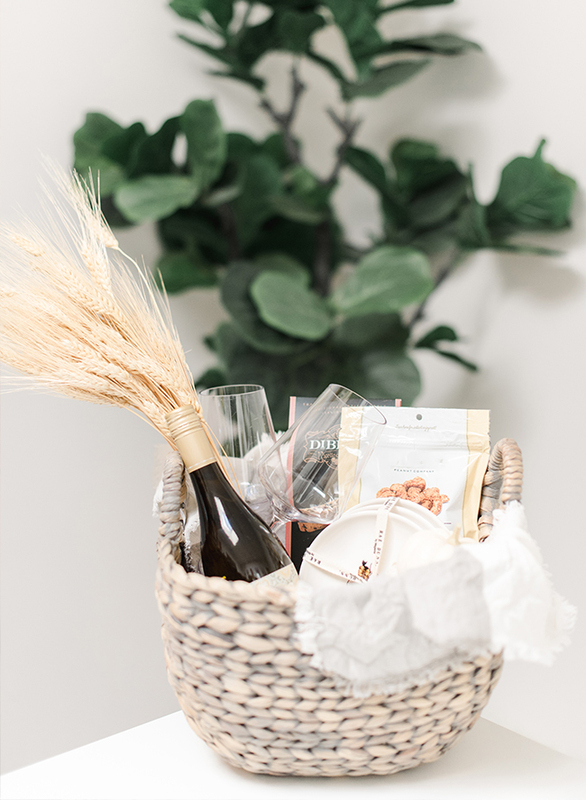 Whether your host is planning a special dinner party, cooking up a delicious meal, or simply opening up their home to friends and family, show your appreciation with a beautiful gift! 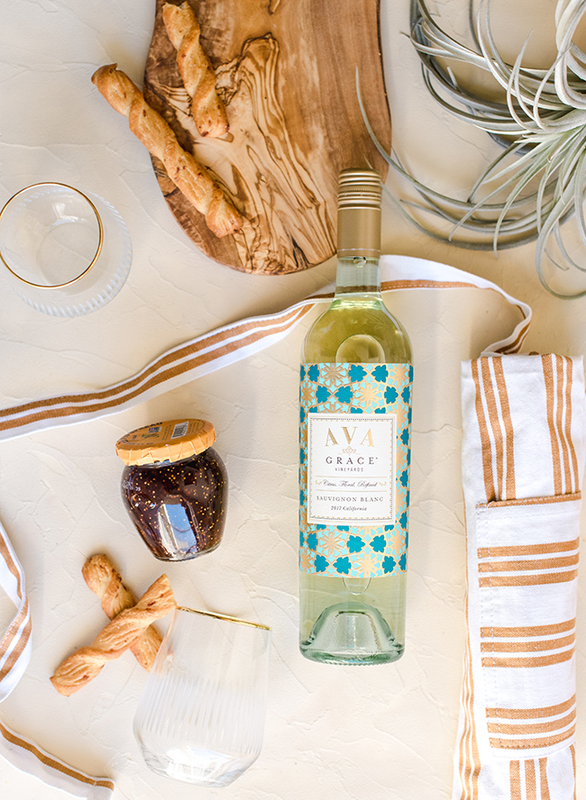 Regardless of what you put alongside it, a bottle of AVA Grace wine will go a long way. 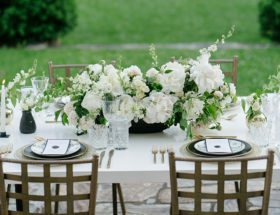 Plus, you can enjoy it all together as the perfect addition to any celebration. 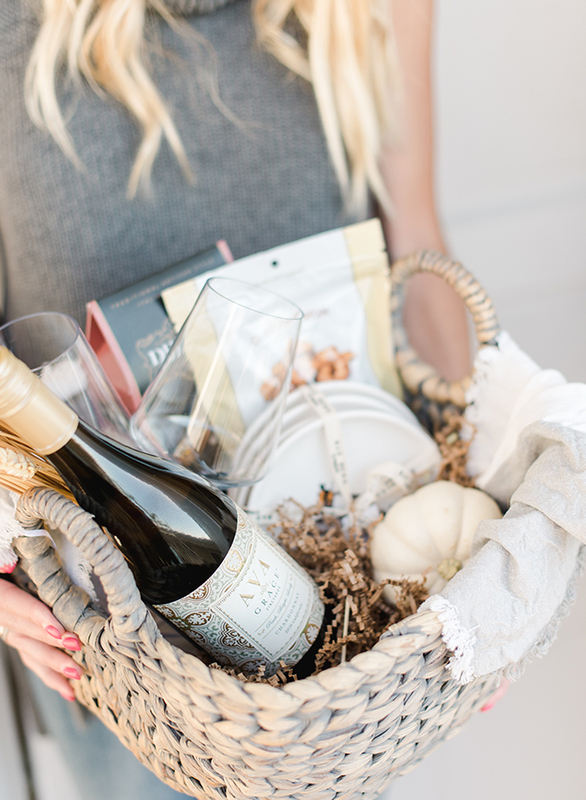 And who doesn’t love a homemade hostess gift basket? 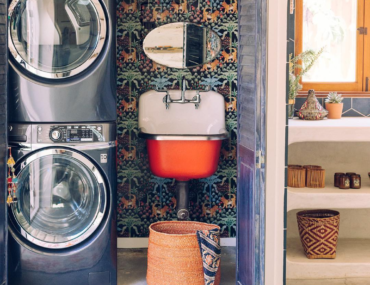 What would you put in yours? Loving those baskets!! Now I want to try this! Ummm I would love to get one of these baskets! So cute! !